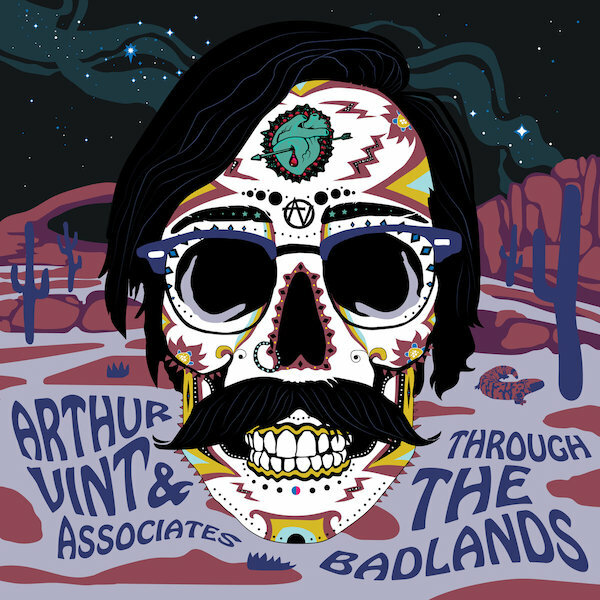 Arthur Vint & Associates new album, Death Rides A Horse, further explores themes from their debut album, Through The Badlands, this time focusing on the music of the great Spaghetti Western soundtrack composer Ennio Morricone. The band interprets music featured in the films A Fistful of Dollars, For A Few Dollars More, The Good, The Bad & The Ugly, Once Upon A Time In The West, Vamos A Matar Compañeros, and of course, Death Rides A Horse in their unique country/jazz style. Bandleader, composer and drummer Arthur Vint steps out in a new role of arranger, taking Morricone's often orchestral pieces and tailoring them for his 9 piece ensemble of harmonica, violin, saxophone, bass clarinet, electric and acoustic guitars, piano, bass and drums. Ropeadope Records will release Death Rides A Horse on Friday, July 14th. When you see Arthur Vint you can tell he is from Tucson, and when you hear his debut album - THROUGH THE BADLANDS - you can hear the depth of his love for the west. But make no mistake, Arthur is in New York now, and he has the band to prove it. Rich Perry, Jon Cowherd, and Tony Scherr are some of the 'Associates' that Arthur has assembled for this record, and the quality is clear. Through The Badlands reminds us a bit of Tin Hat Trio, but with a strong sense of jazz and rock throughout. We're already hearing great things about this one from those who KNOW, and we hope that you will like it too. Originally from Tucson, Arizona, Arthur Vint began studying music seriously at the age of twelve and by the time he was fifteen was already performing professionally. Vint moved to New York City in 2007 to attend William Paterson University where he earned a Bachelors of Music and studied with Kevin Norton, Bill Goodwin, Rich DeRosa, and Steve LaSpina. He graduated with his Masters degree in 2013 from the Manhattan School of Music where he studied with John Riley, Bobby Sanabria, and Dave Liebman. Arthur has appeared at many well-respected NYC venues including The Blue Note, Dizzy's Club Coca Cola, The Cornelia Street Cafe, Smoke, Joe's Pub, Le Poison Rouge, The Stone, The Music Hall of Williamsburg, Gramercy Theater, The Museum of Modern Art, Symphony Space, The Appel Room at Lincoln Center, as well as the Isaac Stern Auditorium at Carnegie Hall. He has toured extensively, both domestically and internationally, appearing at Jazz Festivals throughout Europe and North America. He maintains a busy performing and recording schedule in the New York area with a plethora of different groups including swing bands The Brain Cloud and The Midnight Society Orchestra, country outfits North of Amarillo and Zephaniah O’Hora & the 18 Wheelers, modern jazz ensembles GaDaDu and The Synesthetics as well as his own group, Arthur Vint & Associates. Arthur can also be seen on screen playing the drums in episodes of Boardwalk Empire, The Knick and the blockbuster movie John Wick, in which he also appears on the soundtrack with The Candy Shop Boys.